Figure 5: (a) Schematic of the acoustic-based mixing device. This device includes a PDMS microfluidic channel and a piezoelectric transducer. (b) Schematic showing the acoustic streaming phenomenon around the tip of an acoustically oscillated sharp-edge. (c) Schematic showing the design of the channel and sharp-edge. 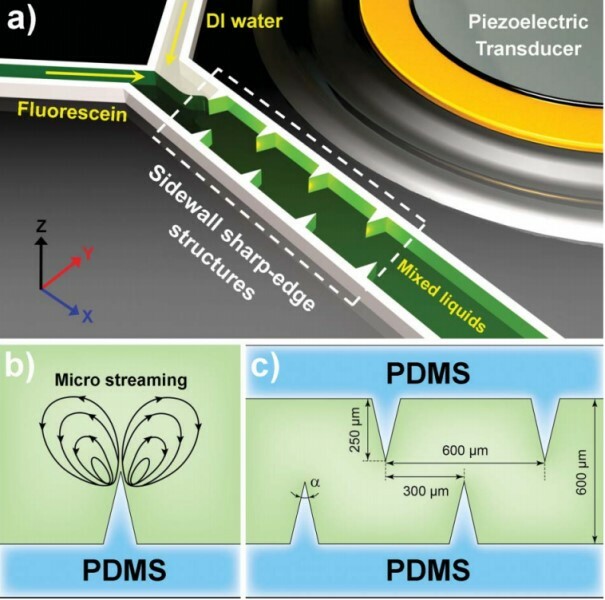 Rapid and homogeneous mixing inside a microfluidic channel is demonstrated via the acoustic streaming phenomenon induced by the oscillation of sidewall sharp-edges. By optimizing the design of the sharp edges, we achieved excellent mixing performance and fast mixing speed in a simple device, making our sharp-edge-based acoustic micromixer a promising candidate for a wide variety of applications.